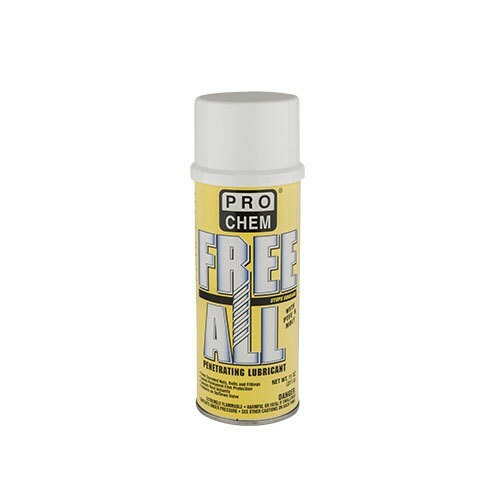 Free All | Pro Chem, Inc.
FREE ALL penetrating lubricant creeps into crevices and covers metal surfaces with a thin film of molybdenum disulfide and polytetrafluoroethylene, which can withstand extreme conditions, including broad temperature and pressure ranges. FREE ALL features a forceful spray which provides rapid penetration for loosening frozen and rusty nuts, bolts and mechanical parts. Safe on plastics, rubber, aluminum and painted surfaces. To start wet engines: Remove distributor cap, spray lightly. Let stand for a few minutes. Wipe any excess residue with a clean, dry towel. Allow to dry before reinstalling. Lightly spray entire electrical system. Allow to dry before starting. To loosen rusted parts: Apply liberally and allow to run off. To protect metal surfaces: Spray on a light even film. Repeat applications if necessary.